The Azure based collaboration portal allows project managers, IT professionals, and partners visibility into the deployment of your ERP and CRM projects. This project transparency allows your company better time to value, and lower total cost of ownership. LCS, included as part of the common data model for Dynamics 365, is a Microsoft Azure-based collaboration portal that provides a unifying, collaborative environment along with a set of regularly updated services that help you manage the application lifecycle of your Microsoft Dynamics 365 Finance & Operations implementations. This tool puts everything in one place to help enable predictable, repeatable, high quality ERP implementations and upgrades. Align Microsoft Dynamics 365 processes with industry-standard processes, as described by the American Productivity & Quality Center (APQC). Identify fit and gaps between user requirements and the default functionality that Microsoft Dynamics 365 provides. Usage profiler – Usage profiler is a data-gathering tool that helps you describe your projected or current usage of a Microsoft Dynamics 365 implementation. The usage profile that is generated can be used for various purposes, and can really help your IT department in that it figures hardware sizing and support needs. System Diagnostic – System diagnostics helps administrators monitor Microsoft 365 environments. License sizing estimator – License sizing estimator helps you estimate the number of licenses that are required for 365. It provides a shared workspace that lets you model default and customized roles, and then automatically calculate the required client access licenses (CALs). Cloud-hosted environments – Cloud-hosted environments is a tool that you can use to deploy Microsoft Dynamics 365 environments on Microsoft Azure. When you use Cloud-hosted environments, you must select the type of Microsoft Dynamics 365 environment to deploy, such as a demo, developer/test, or production environment. Based on your selection, the Cloud-hosted environments tool provisions the appropriate number of virtual machines (VMs) in Azure. These VMs have Microsoft Dynamics 365 components (and all their prerequisites) already installed on them. Cloud-powered support – Cloud-powered support helps you manage support incidents. It lets you create a VM in Azure that has the same hotfixes installed as your local environment. You can reproduce and record an incident on the VM, and then submit the incident to our support team. Support follows up by investigating and, if possible, testing a fix on the VM, and then sends the fix back to you for verification. They are managed as part of an LCS project. They run the Data Import/Export Framework. Customization Analysis – Customization analysis validates model files against best practices and provides a report of potential areas for improvement. Upgrade Analysis – Upgrade analysis helps you plan your upgrade to the latest version of Microsoft Dynamics 365 by analyzing code artifacts from Microsoft Dynamics AX 4.0, Microsoft Dynamics AX 2009, or AX 2012. 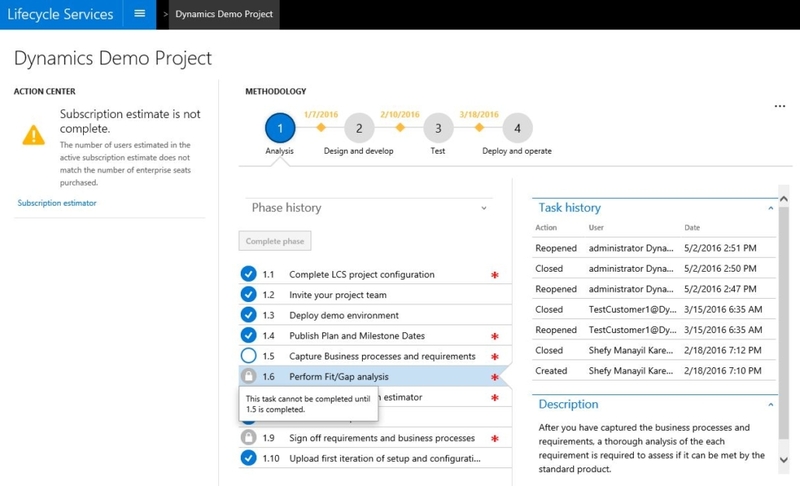 And most importantly, implementation projects are automatically created when a customer signs up for Dynamics 365 for Finance & Operations.